Devon Air Ambulance prides itself on being a dynamic and forward-thinking charity, committed to providing the very best patient care and ensuring the service continues to grow and improve. The exciting next step in this development took place yesterday (Thursday 16 August), with the purchase of a new state of the art Airbus H145 helicopter, which will be on duty from the service’s Exeter airbase from mid-2020. 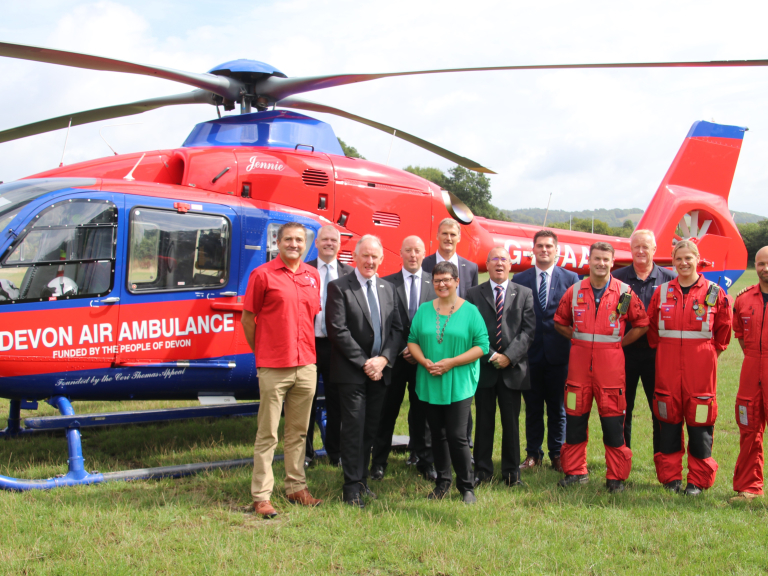 The contract was signed at Sidmouth RFC’s training ground in Sidford, chosen as it is only a few miles away from Sidbury, where Devon Air Ambulance’s founder Ann Ralli and her family lived. Ann set up the Devon Air Ambulance charity after her son Ceri died, due to injuries sustained when knocked from his bicycle. Ann asked at hospital what could have saved her son, and was told the quicker a patient receives urgent medical treatment, the better their chance of survival. Ann didn’t want any other family to go through what hers had. The existing helicopter, which is already ‘night flight ready’ and operates up until midnight every day, will replace our older aircraft, currently flying from the service’s North Devon airbase near Umberleigh. Devon Air Ambulance owns its current two aircraft. The new aircraft purchase will cost in the region of €8.5m, but this will be offset by the onward sale of the older helicopter, G-DVAA. 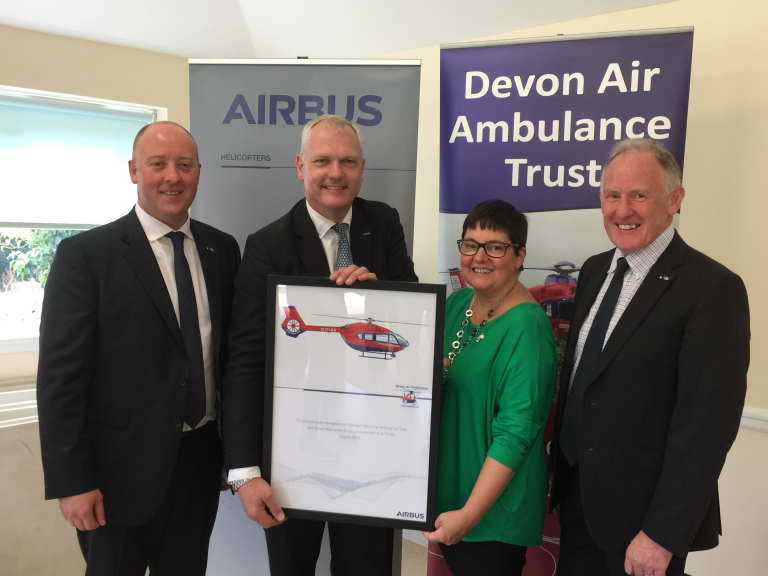 Ian Payne, Flight Operations Director for Devon Air Ambulance added “We are looking forward to welcoming the H145, registration G-DAAS in 2020. The aircraft type which was chosen for many reasons, is in service with several air ambulance units in the UK and numerous emergency operations throughout Europe. “A successful, mature product, H145 is manufactured by the same organisation as our EC135s so in addition to operational performance we will be able to build further upon the strong working relationship with Airbus developed over many years. Airbus Helicopters will be providing the charity with updates and photos throughout the build of G-DAAS and we plan to share this with all our supporters through social media.